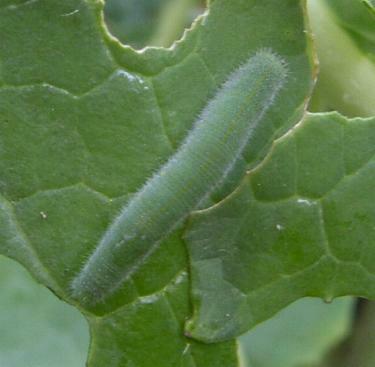 The Small Cabbage White Butterfly larva is probably the most destructive of all of the caterpillars, devouring cabbages and other cruciferous crops all over the world. The adults are distinguished from the Large White by their smaller and less pronounced black markings. The adult male has one spot on the wing and the female has two - both have a pale yellow underside to the wings. where the leaf tissue has been eaten, but not all the way through. After mating the female lays eggs, usually singly and close to the edges, on the leaves of cruciferous plants. They can be on the lower and upper surface. The light green larva which hatches out usually occurs on its own, whereas the more easily seen mottled larvae of the Large White are found in clusters initially. The Brimstone Butterfly (Gonepteryx rhamni) with bright yellow wings, has a similar coloured larval stage. As with any destructive caterpillar, crush them or spray with insecticide if the infestation is widespread. Check the leaves of cabbage and turnip when the butterflies are about, the eggs are off-white and usually laid singly on the lower surface, but sometimes on the upper surface. Rub them off and any of the small larvae which may have hatched. See the monograph on the Large White Caterpillar for other methods of control.